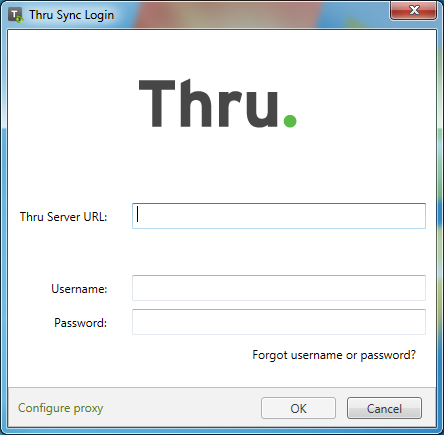 After installing Thru Sync to your desktop, you will be prompted to setup your Thru account. Enter your Thru Server URL, Username and Password. After successfully logging in, you will be able to choose Thru folders from your account to sync with your computer. First, select the location you would like to sync your folders. The default location is C:\Users\Your User Profile\Thru. Next, choose the folders you would like to sync to your desktop. 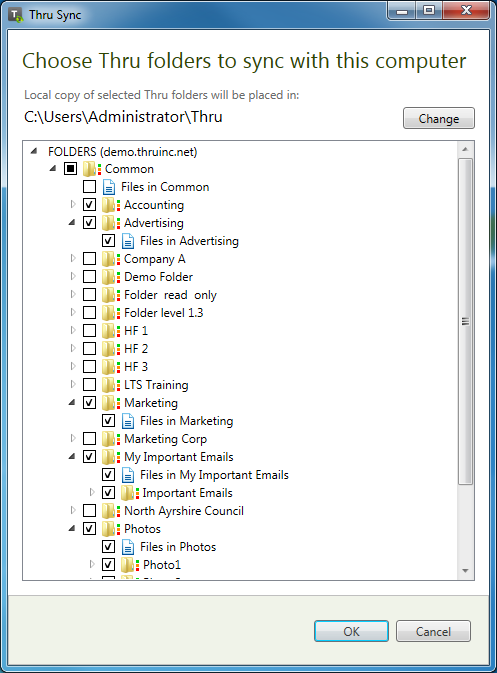 Select a folder by clicking the checkbox next to each folder. Use the arrows to locate sub-folders. Click the OK button at the bottom of the window to sync the selected folders to your desktop. Note : Once files are synced, a Thru folder will be created in the Favorites section of your desktop file system. All content synced from your Thru account will be accessible in that folder.